The intention of this page is to help the visitor understand the geography of Cyprus and become more familiar with the position of turkish occupied Lapithos and Karavas (Lambousa). The page will also help understanding the size of the illegally occupied area, and provide some information on the events of the barbaric 1974 turkish invasion against Cyprus. 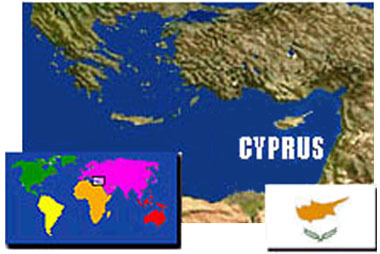 The Geographic Location and Flag of Cyprus. 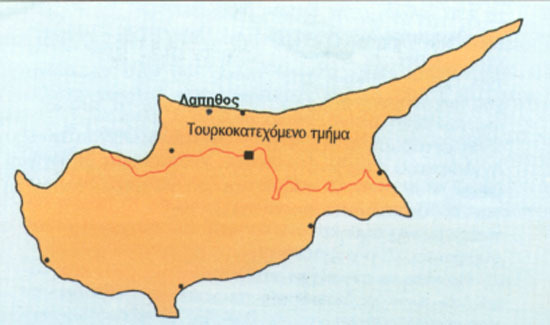 A map of Cyprus showing the exact location of Lapithos. 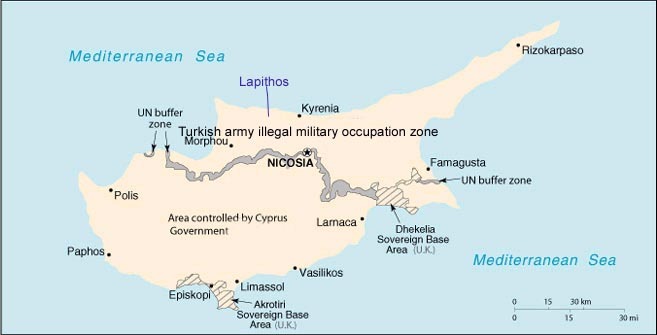 The 37%turkish illegal occupied part of the Cyprus is also shown in this picture. 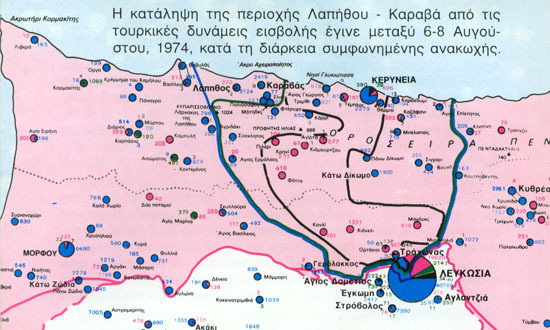 Before August 7 1974 Turkish troops were inside the black lines shown on the map. During the scheduled by the UN armistice they advanced and occupied Lapithos and Karavas among many other villages taking under their control the area enclosed by the blue lines. Women were raped and small children and elders were brutally killed. A map showing the whole Island of Cyprus. 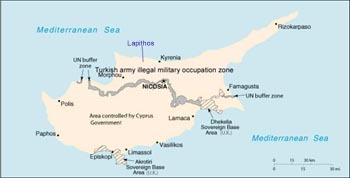 The part above the red line is illegally occupied by barbarian Turkish troops after July 20 1974 brutal Turkish invasion against defenseless Cyprus. A more detailed map of the area. Both villages (Lapithos and Karavas) that were named as Lambousa in the old times are shown on this map. Please remember that Lapithos and Karavas (the two towns of Lambousa), are ILLEGALLY occupied by the Turkish troops since 1974 and they are not accessible to their GREEK CYPRIOTS lawful inhabitants.